EG Capital Advisors has a strong emerging markets pedigree, global reach and proven track-record catering to the demands of wholesale and institutional investors worldwide. The firm’s value creation is based on rigorous investment analysis, prudent risk management, in-depth research and continued client relevance. EG Capital Advisors’ solid track-record underpins the commitment of our investor base and manifests our unrivalled unique bottom-up alpha generation approach. EG Capital Advisors’ objective is to continuously generate high current yield returns across the existing asset classes, and form strategic partnerships globally in search of growth opportunities and new investment ideas. 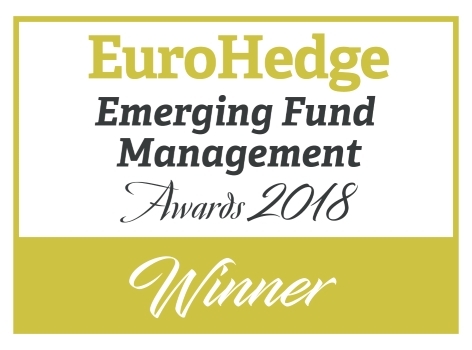 This award (these awards) was/were won by EG Life Sciences Fund I, which is managed by EG Capital Advisors, Cayman Islands. This fund is distributed by EG Capital Advisors UK Ltd.
EG Capital Advisors Cayman Islands manages the Group’s Fixed Income Cayman Island Funds and Managed Accounts, private equity strategies and EG Life Sciences Fund. Mirabella Financial Services LLP is the investment manager of the Irish UCITS vehicle, EG Capital Advisors ICAV (Irish Collective Investment Vehicle), with KBA Consulting Management Limited acting as Management Company. Mirabella Financial Services LLP has seconded key personnel from EG Capital Advisors UK Limited to manage the EG Capital Advisors ICAV. Unless otherwise stated, all references to EG Capital Advisors are to the EG Capital Advisors group of companies. All references to the Investment Team are to the investment team at EG Capital Advisors Cayman Islands.